Nobles are native to the Siskiyou Mountains of northern California and the Cascade and Coastal ranges of Oregon and Washington. It closely resembles the California red fir (Abies magnifica var. magnifica), commonly used as an uncultured tree called “silver tips” in the California fresh tree market, and the shasta fir (Abies magnifica var. shastensis) that is grown in some Pacific Northwest Christmas tree plantations. It grows in middle- to upper-elevation coniferous forests and is often associated with Abies amabilis (or “silver fir”) and other conifers. The best stands are found in moist, middle elevation areas with deep, rich soils. Middle-elevation stands are usually more open than low-elevation forests and occur on poorer, thinner, rockier soils in areas more frequently disturbed by wind, snow and sometimes fire. Its lumber is sometimes marketed as “Oregon larch” – possibly after the Larch Mountains because they were covered with towering stands of noble fir. Beginning with the British colonists, eastern white pine (or white pine) has proven to be one of the most important and most desirable species of North America. It is a truly magnificent tree attaining a height of 80 feet or more at maturity with a diameter of two to three feet. White pine is considered to be the largest pine in the United States. In colonial times, white pines above 24 inches in diameter were reserved for England to be used as ships masts. These trees were identified by blazing a broad arrow on the trunk. Because of the colonists general dislike of British rule, this “broad arrow” policy was one more source of friction between the two. Until about 1890, white pine was considered the species of choice for most commercial uses. It is the state tree of Maine and Michigan. Fraser fir was named for John Fraser (1750-1811), a Scot botanist who explored the southern Appalachian Mountains in the late 18th century. The species is sometimes called Southern balsam or Southern balsam fir. Locally Fraser fir is known as “She balsam” because of the resin filled blisters on the tree’s trunk. Red spruce, often associated with Fraser fir, is called “He balsam” and lacks the distinctive blisters. Leaves (needles) are flattened, dark-green with a medial groove on the upper side and two broad silvery-white bands on the lower surface. These bands consist of several rows of stomata (pores). Leaves are 1/2 to one inch long, have a broad circular base, and are usually dark green on the upper surface and lighter on the lower surface. On lower branches, leaves are two-ranked (occurring in two opposite rows). On upper twigs, leaves tend to curl upward forming a more “U-shaped” appearance. 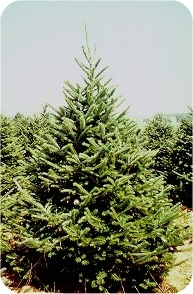 Principal uses are generally the same as for balsam fir, although Fraser fir has been used less for timber because of the difficult terrain on which it grows. The wood is soft and brittle and may be used for pulpwood, light frame construction, interior knotty paneling, and crates. 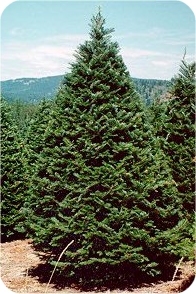 Fraser fir boughs have often been used for “pine pillows” and bed stuffing. The pollen strobili are yellowish and the cones are yellowish-green to green, cylindrical, erect, 2 to 4 inches long, occur high in the crowns and dissipate in the fall to release their seeds. The bark is grayish-brown, usually with white mottles, smooth with resin blisters when young, becoming rigid and then scaly with age. Like most other true firs, it is thinned barked and therefore very sensitive to fire. Control of fires in the drier southern parts of the northwest has allowed a widespread increase of grand fir over the last 50 years. It grows from British Columbia inland to Montana and south into northern California. It grows in dry to moist coniferous forests in rain shadow areas, often in association with Douglas-fir. It commonly ranges from river flats to fairly dry slopes from low to middle elevations. Past research has identified the “Panhandle” area of Idaho as a desirable seed source. Most seedlings produced for Christmas tree growers originate from this region. It is germinated from seed in both greenhouses and bare root nurseries and usually transplanted in a nursery for one to two years. It is a minor Christmas tree species throughout Washington and Oregon, but a major species in the inland states of Idaho and Montana. It produces a beautiful, thick foliaged tree when sheared and is known for its strong fragrance. In most areas, it will produce a marketable tree in eight to ten years. Grand fir and white fir are softwoods with characteristics so similar that they are used interchangeably. They are moderately strong and light weight. Earlywood is creamy white to light brown while the latewood gradually changes to reddish brown or a lavender tinge. The heartwood is indistinct. The wood is relatively straight grained and easy to work. It is most often sold as White Wood, Hem-Fir (Hemlock-Fir) or ES-AF-LP (includes Engelmann spruce, alpine fir and lodgepole pine) for construction. It is also used for boxes, decoration and utility. It has excellent resistance to splitting in nailing and screwing and has outstanding gluing qualities. Northwest native Americans have a history of making uses of grand fir foliage and branches. Kwakwaka’wakw shamans wove its branches into headdresses and costumes and used the branches for scrubbing individuals in purification rites. The Hesquiat tribes used its branches as incense and decorative clothing for wolf dancers. 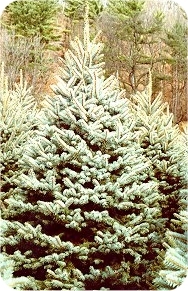 White fir is tolerant of a considerable amount of shade. Its best growth is on moist loamy soils, but may often be found on dry, thin soils. The species seldom occurs in pure stands but grows in association with numerous other species depending on location and elevation. White fir is commonly found with Douglas-fir, sugar pine, ponderosa pine, and red fir. White fir is severely damaged by mistletoe. Leaves of white fir are often attacked by spruce budworm and Douglas-fir tussock moth. Bark beetles may also be a serious problem in some areas. 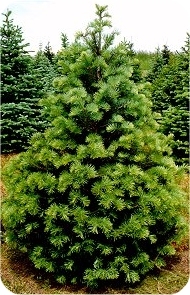 As a Christmas tree, white fir has good foliage color, a pleasing natural shape and aroma, and good needle retention. 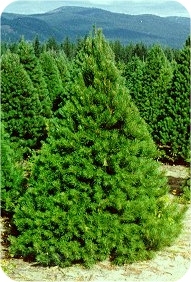 White fir has one of the largest ranges of any of the commercial western firs. It can be found from the Rocky Mountains in Colorado and New Mexico to the Coast Range in California and Oregon. White fir occurs from 6000 ft. to 11,000 ft. in elevation in the Rocky Mountains and as low as 2300 ft. near the Pacific Coast. Differences in habitat as well as growth requirements and morphological characteristics have led some authors to propose the separation of white fir into two taxonomic varieties, one in the Rocky Mountains and the other in the western part of the species’ range. Most propagation is by seed, although both rooting and grafting has been successful. Most vegetative propagation has been to increase the number of rarer forms. Several cultivars have been propagated including a weeping white fir sold under the name of Abies concolor `Pendula’. Abies balsamea occurs naturally from northern Alberta to Labrador, southward to Pennsylvania. This geographical distribution is larger than for any other North American fir species. A variety of balsam fir, phanerolepis, occurs as far south as West Virginia and Virginia (38 degrees north latitude). This variety is best described as an intermediate form between balsam fir and Fraser fir although classified with balsam fir.